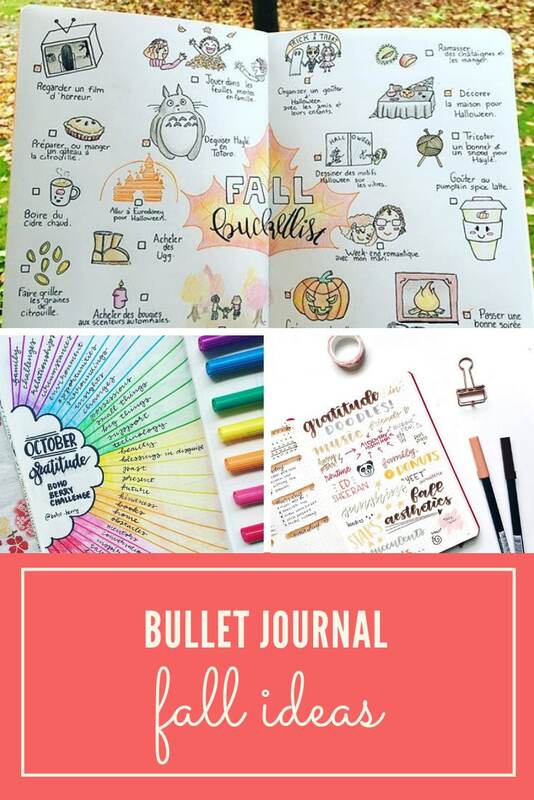 We usually post collections of monthly bullet journal themes to help you with your planning, but since fall is such a wonderful time of the year we thought we’d share some Bullet Journal ideas for fall theme pages that’ll last you from September through to the end of November. Gratitude Page – It is a great idea to express gratitude year-round, but fall just seems like the time to incorporate it into your life. From Thanksgiving (if you celebrate it), to just wanting to be more thankful in general, it is the perfect time to add a gratitude page. You can have 1 or 2 simple pages decorated with some fall leaves, where you list at least one thing you are grateful for each day. Fall Bucket List – Who doesn’t love a good bucket list? This is like a to-do list, but it is more about fun things you would like to do in the fall. Think about fall activities like attending a local fair your town has in the fall, or going to a pumpkin patch. More on this in a later section. Holiday Planning Spreads – There are a few holidays and events that occur this time of year, so it can be helpful to have some fall-specific holiday pages. This might include a page all about planning Halloween costumes and a Halloween party, or working on your menu for Thanksgiving. Fall Collections – Lastly, think about some fall-specific collection pages, like movies you want to watch this season or goals you would like to accomplish. 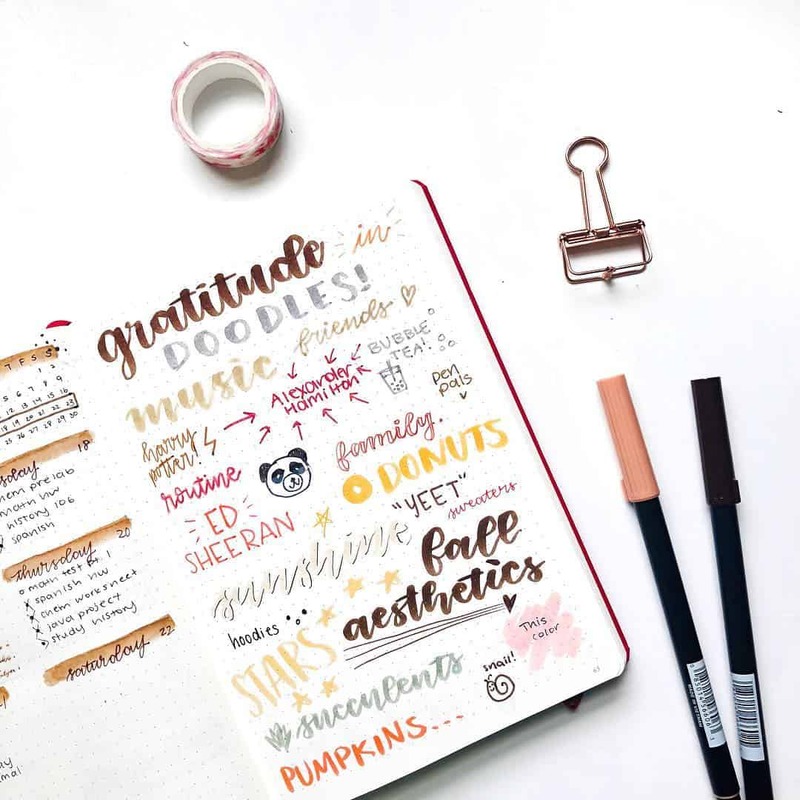 Having a section in your bullet journal for gratitude is an amazing habit to start this fall because it’s a good time to pay attention to what you are grateful for. And of course it really is a spread you’ll want to have in your journal all year round! What are the benefits of expressing gratitude? It helps you focus on the positive. Many people have a tendency to only focus on the negative, such as what you don’t have, things you want to accomplish but haven’t yet, and other daily struggles. If you want to be more positive and optimistic, focus on the good in your life with gratitude. You improve your ability to empathize with others. Empathy is a very powerful emotion, and one you might not realize you possess. With more empathy, you are able to connect with others on a deeper level and really understand what they are going through. This is yet another benefit of expressing gratitude in your own life. It improves your mental and emotional health. Whether you deal with stress, mental health disorders like anxiety or depression, or just feel blue this time of year, it can be good to give yourself a little pick-me-up. You can boost your own self-esteem. No matter how you feel about yourself, you can boost your self-esteem by expressing gratitude. You are focusing on the good things in your life and your own abilities and successes. 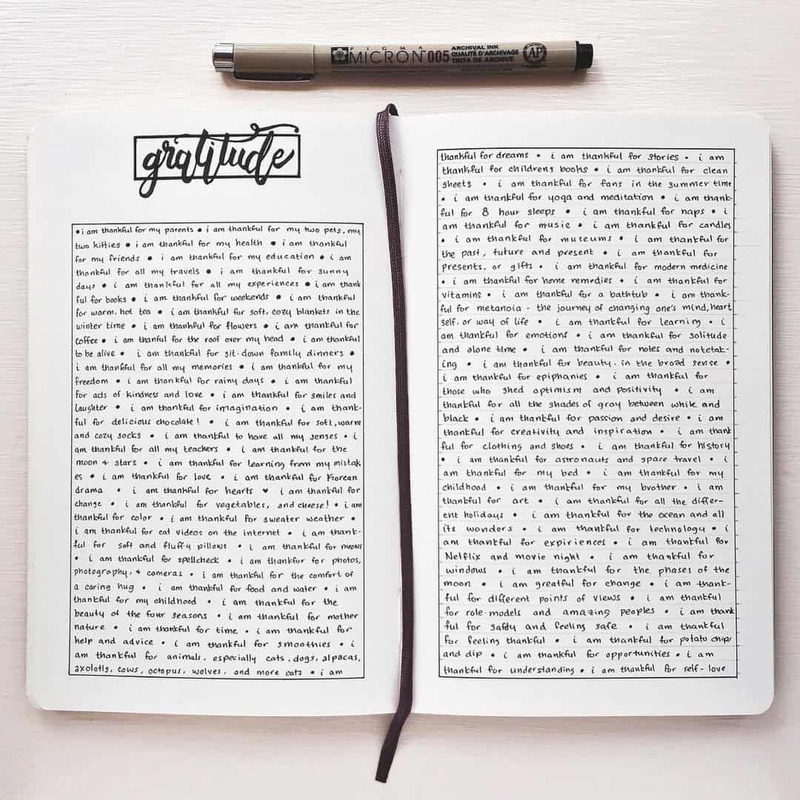 It is really easy to add a gratitude page to your bullet journal. You can start with just one page if you intend to keep it short, but multiple pages is also a good idea. Make a goal to write at least one thing you are grateful for each day. Keep the page close to your calendar or task pages so you remember to use it. Eventually, you can have more goals, such as listing 3 things in different categories, such as what you accomplished, a way you helped someone else, and something good that happened. I love this gratitude spread because it’s so bright and colorful! This is a really simple way to practice gratitude during the month, there is one “ray” for each day and you just need to choose one word to describe what you are grateful for. If doodles are more your thing then try a gratitude spread like this one. I like how she picked out red and orange color pens that are reminiscent of fall leaves. 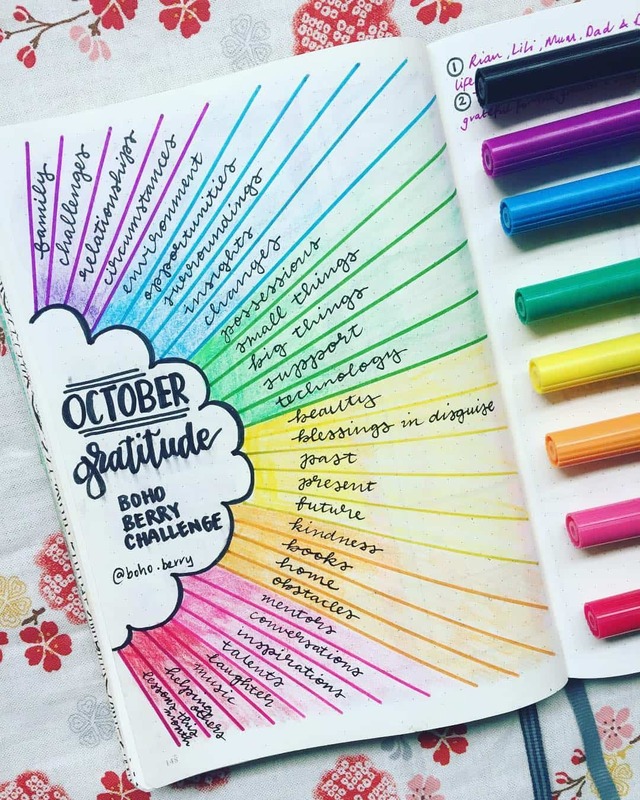 If you prefer a minimalist style for your Bullet Journal you might want to try laying your gratitude spread out like this one. It’s a good choice if you want to write whole sentences or even more. Or you could just stick to a word a day and only use a one page spread. 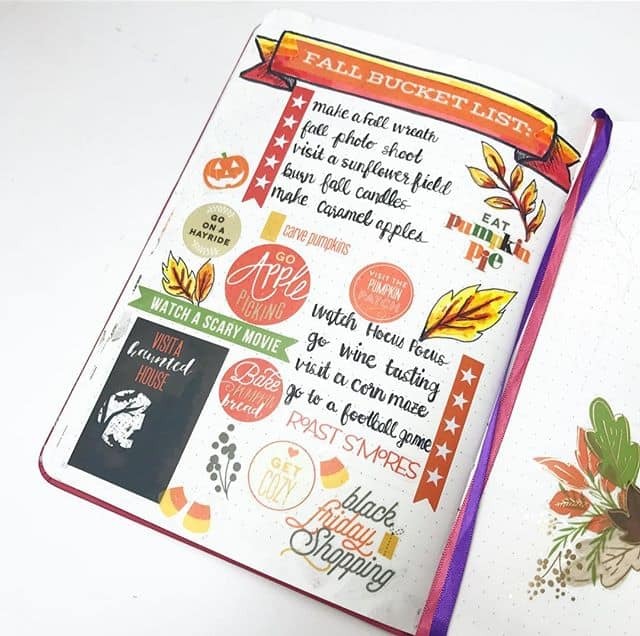 When you are making plans for the various layouts and pages to include in your fall bullet journal, don’t forget about the bucket list! Bucket lists and other to-do lists will keep you on track and can even be a lot of fun. Think of a bucket list as a list of things you want to do, see, or accomplish. Many bucket lists include short and long-term goals, from wanting to go on a trip to another country, to starting your own business. Bucket lists also include small actions that you want to complete in a month, or during a season. You might also have a bucket list for things you want to accomplish by a certain age. With a fall bucket list, it is simple a to-do list of things to do during the fall season. These can be a combination of fun and productive actions. 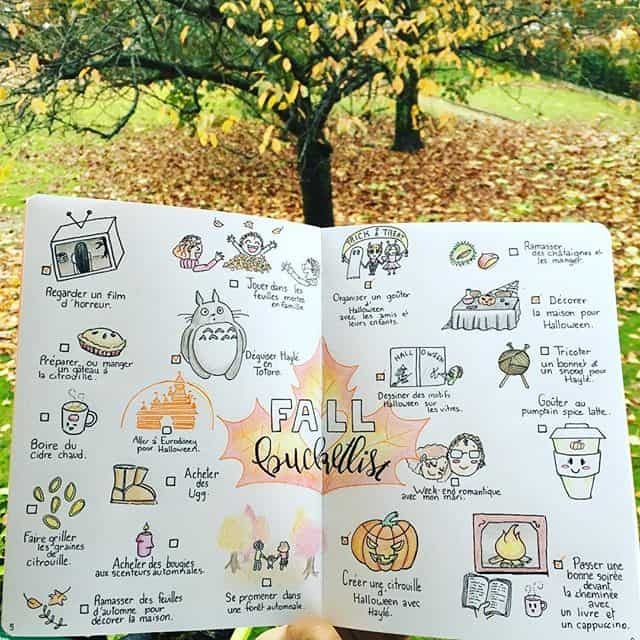 I love this fall bucket list spread with all it’s doodles, and such a good idea to include a little checklist so you can mark them off as you go! This bucket list is just a list, but a spread like this would give you the chance to practice your hand lettering. I love the little star ribbons on this layout that you could color in as you check the items off your list! If you’d like some fall themed stickers to decorate your spreads with they have lots on Etsy, like this cute Hello Fall set, oh and washi tape too! 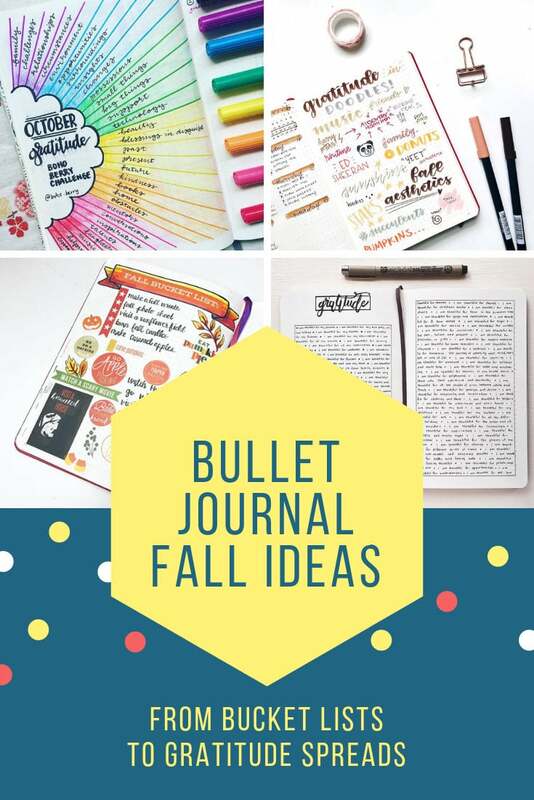 Your Bullet Journal is the perfect place to plan for special events in the fall, since it keeps everything organized, and you have your calendar pages right there for reference. Plan a Halloween Party – Have a page or two dedicated to planning a Halloween party, with information like choosing a location, a theme, list of decorations, food ideas, and any other details you want to keep track of. Brainstorm Halloween Costumes – You can also brainstorm Halloween costume ideas, whether it is for you, your kids, or a family costume. Plan Out a Halloween Dinner – Not interesting in throwing or attending a party? You can also use the bullet journal to plan a fun Halloween-themed dinner. Thanksgiving is near the end of fall, so this is a great thing to plan as well. Depending on where you live, it might not be for this holiday specifically, but others around the same time. Thanksgiving is often very chaotic with everything there is to cook, inviting guests, getting your home ready, deciding what to wear, and various other details. It is really easy to organize these details in your bullet journal. Now let’s get into the fun stuff! 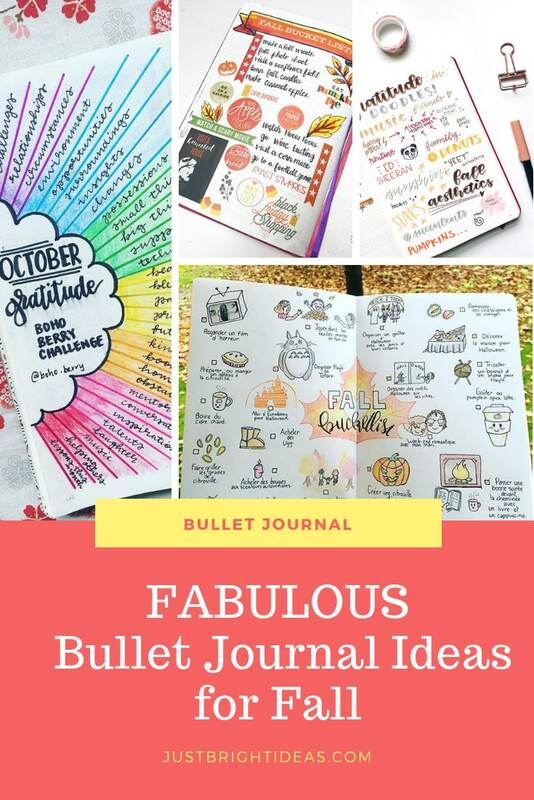 Bullet journals are not just about planning and organizing – you can also use them for all those fun ideas you have in your head. Whether you have a show you want to catch up on or a list of places to go, don’t forget to include them in your bullet journal. 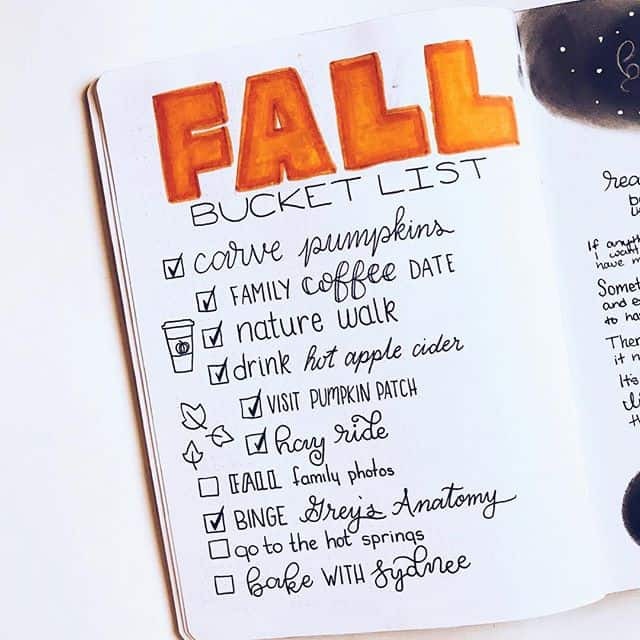 The first type of collection page you can have in your bullet journal is one that describes your favorite things about fall. The purpose of this is to have gratitude, get into a positive attitude, and really prepare yourself mentally for fall. It is a fun page to have that can also be fun to share with others via social media or on your blog. Think of past things you have done in the fall that you might want to include, such as your favorite coffee drink, going to the pumpkin patch as a kid, or having a Halloween party with kids at school. You can also include things you like about fall now to combine nostalgia with things you want to do this season. A shorter list or collection you can keep is places you want to go this fall. Reference the fall bucket list you made earlier, as it might include some of the places. Having this separate collection helps to keep it just to places you would like to go, whether in your own local area or by taking a short trip. Lastly, if you enjoy fall TV or movies, then include a collection with lists of them! 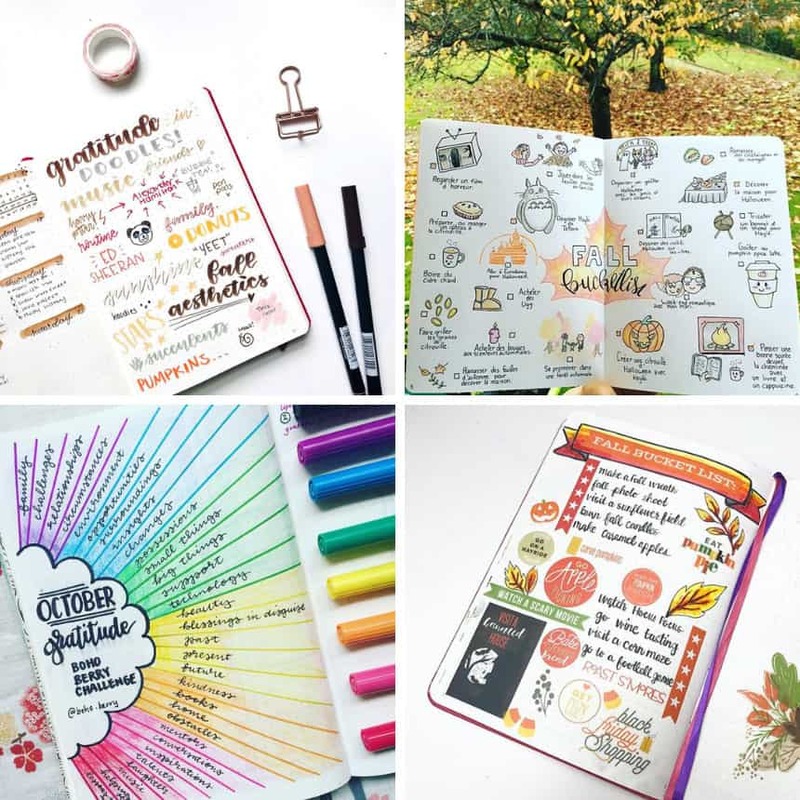 If you LOVE collections then don’t miss our list of 85 Bullet Journal tracker ideas for 2019!